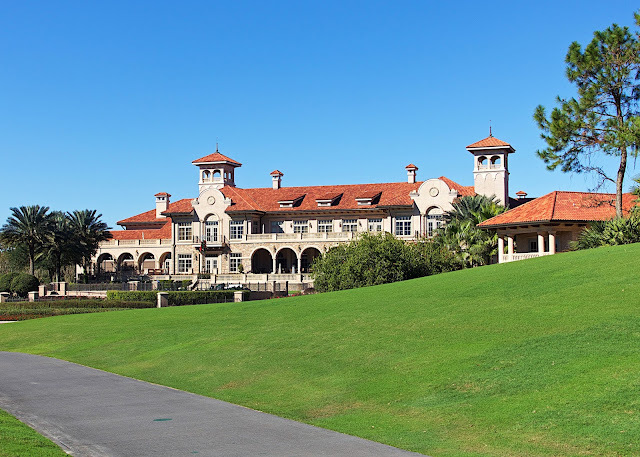 TPC Sawgrass in Ponte Vedra, FL - play the Stadium course and dine in the clubhouse at Nineteen. The food at Nineteen was AMAZING! 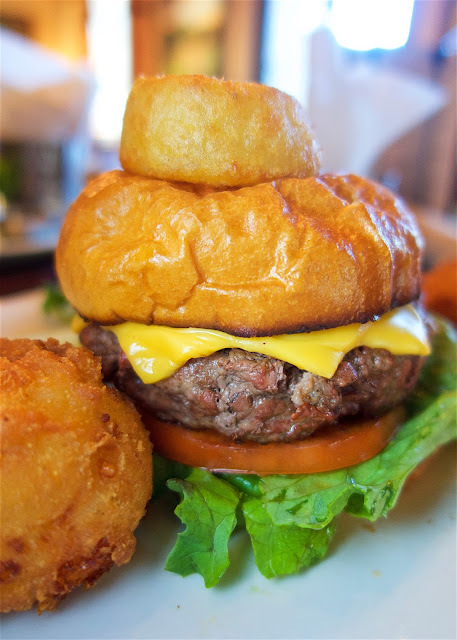 Great golf course and great food! A fun time! 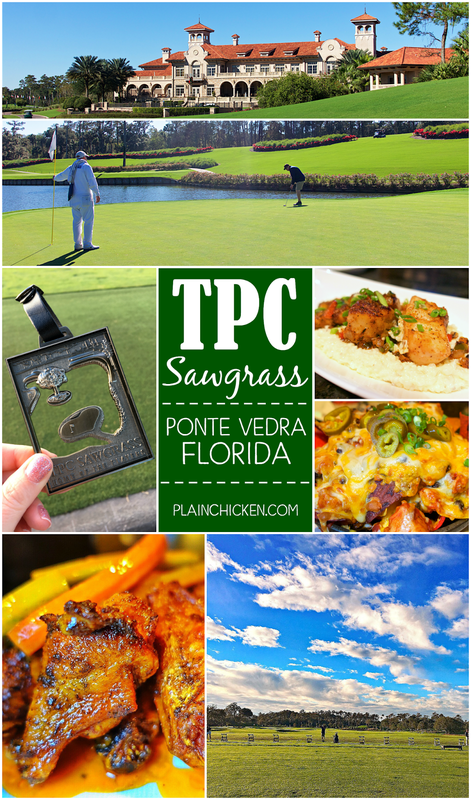 For Christmas, I gave Chicken Legs a golf trip to play TPC Sawgrass in Ponte Vedra, FL. He has always wanted to play the course, but he could never pull the trigger. 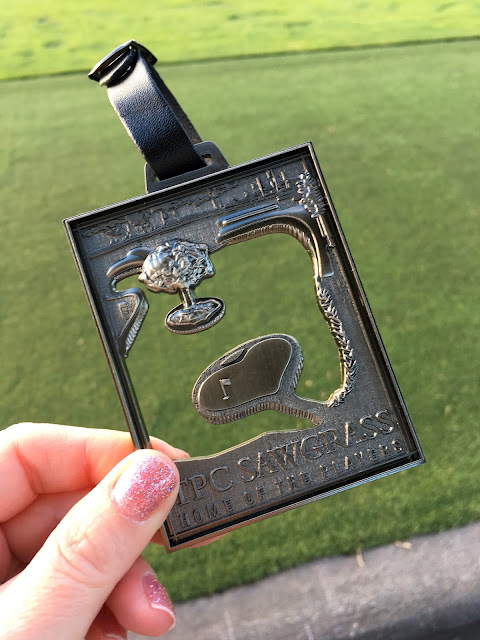 I made us a reservation at the Sawgrass Marriott and him a tee time for the Stadium Course at TPC Sawgrass. He was SO excited when he opened his gift! We had THE BEST time! 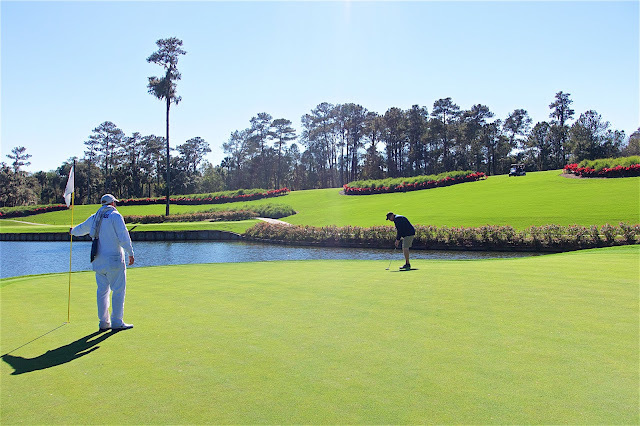 We went into Jacksonville and shopped for a day and played the course the next day. I rode in the cart and took pictures. 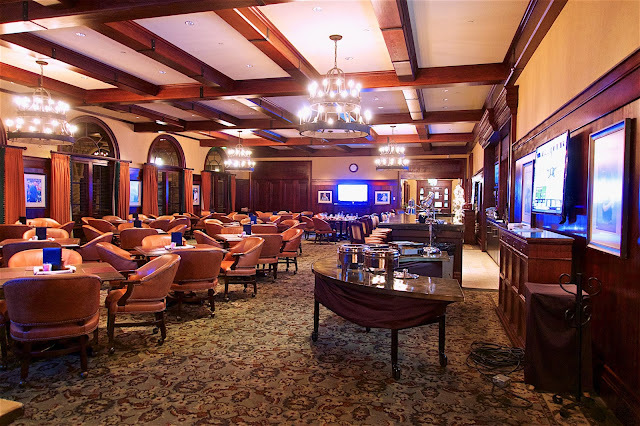 The first night we ate dinner in the TPC Sawgrass Clubhouse. Chicken Legs had read the restaurant, Nineteen, was open to the public. We took the shuttle from the Marriott across the street to the clubhouse. It was SO neat to see the inside of the clubhouse. They have tons of memorabilia from the The Players Championship. 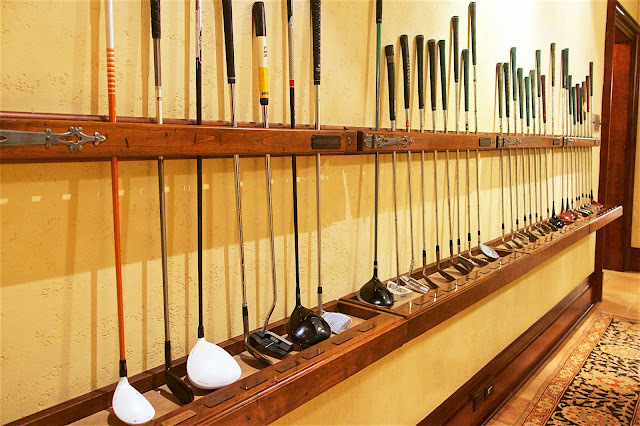 They have a club from every winner of the tournament. Nineteen is open for breakfast, lunch and dinner everyday. They are open from 7:00am to 9:00pm. Since there were only two of us, we decided to sit at the bar. The food was surprising good. 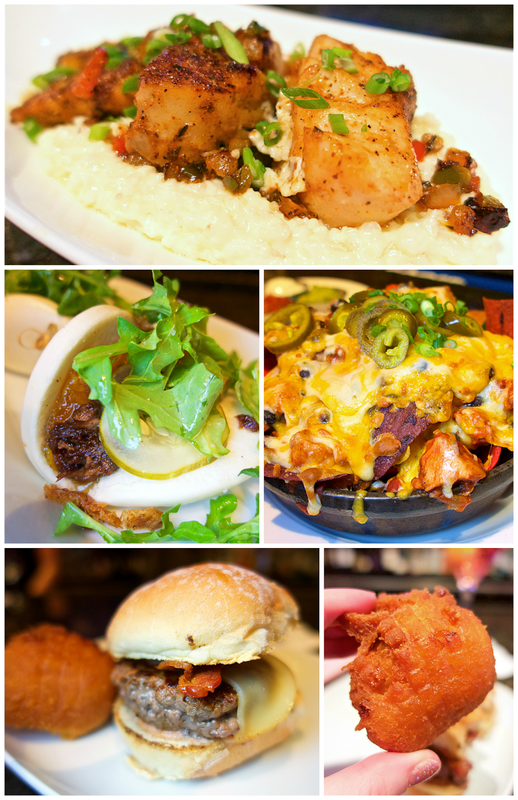 It was actually some of the best food we've ever eaten on vacation. We ended up eating several appetizers for dinner. We started with the Nachos. SOOO good! I could have stopped eating right here. We started talking to the Hospitality Director, David Bacon. He was super nice! He said we had to try the Grouper and Grits appetizer. He brought it out and OMG. SO good. The grits were rice grits. This was the second time we've eaten rice grits. They are crazy good. The grouper was some of the best ever! If it is on the menu, get it!! We had already ordered some other appetizers before they brought us the grouper. I had the Angus Beef Sliders and Chicken Legs got the Duck Steam Buns. I also got an order of the hushpuppies. YUM! We were absolutely stuffed when we walked out of the restaurant! 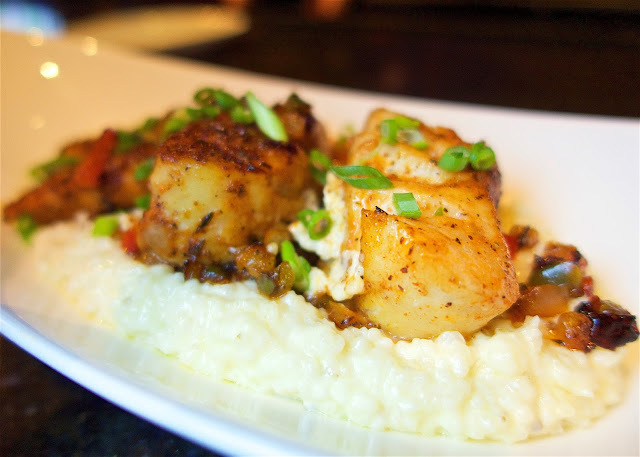 The Grouper and Rice Grits deserves a close up. 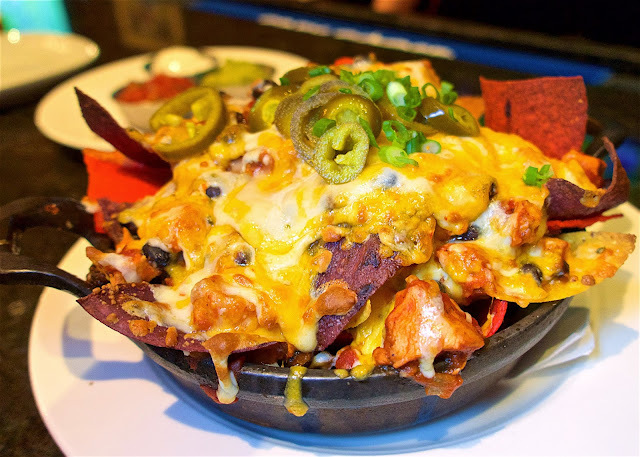 The Nachos also deserve a close up. SOOOOOO good. I wish I had a plate of these right now!! Chicken Legs teed off first thing in the morning. 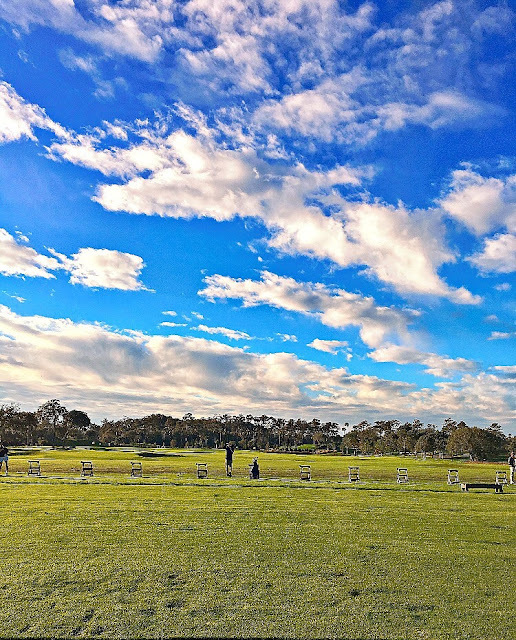 We got to the course a little early so he could hit some balls on the driving range. The group ahead of us included PGA Tour player Jonas Blixt! We got lucky and had perfect weather for the round. We saw a Bald Eagle on the course! I've never seen a bald eagle in the wild before. It was so cool! Here is Chicken Legs putting on the famous island green on #17. After the round, we went back to the clubhouse for lunch. 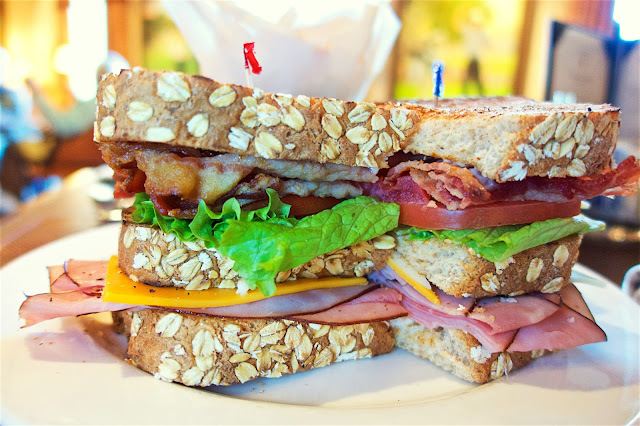 Chicken Legs got the Club - turkey, ham, Applewood smoked bacon, Swiss and cheddar cheeses, lettuce, tomato, toasted whole wheat bread. It came with fries. I was SO tempted to get the Nachos again, but I went with the burger. I got hushpuppies with the burger because I can't resist a good hushpuppy! 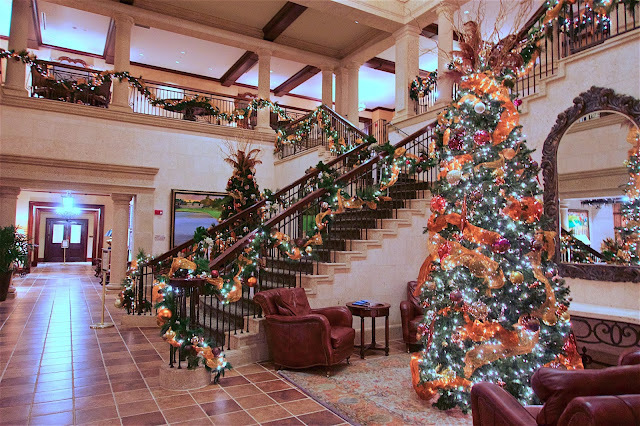 The clubhouse was still decorated for Christmas while we were there. That night we ate in the Marriott restaurant, Pete & Alice's Pub. 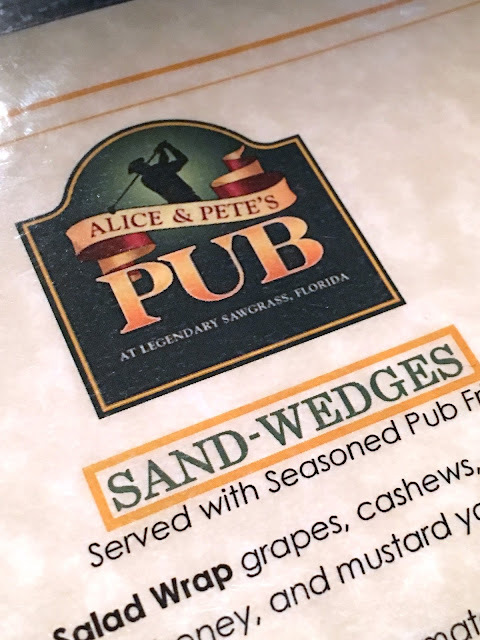 It is named after Pete and Alice Dye. He designed both courses at TPC Sawgrass. We sat at the bar and had a few adult beverages. Chicken Legs got the burger and I got the wings. 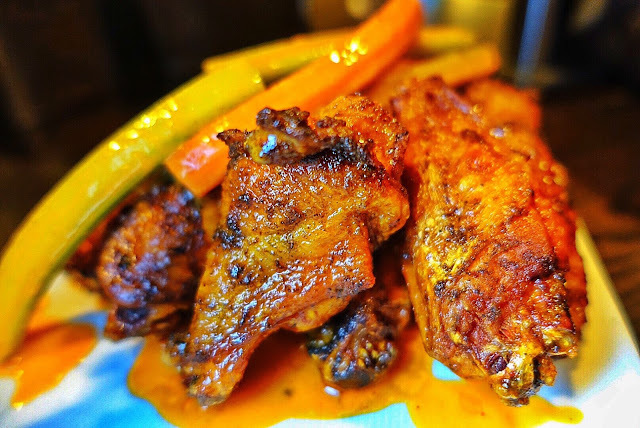 The wings were surprisingly good! I would definitely get them again. 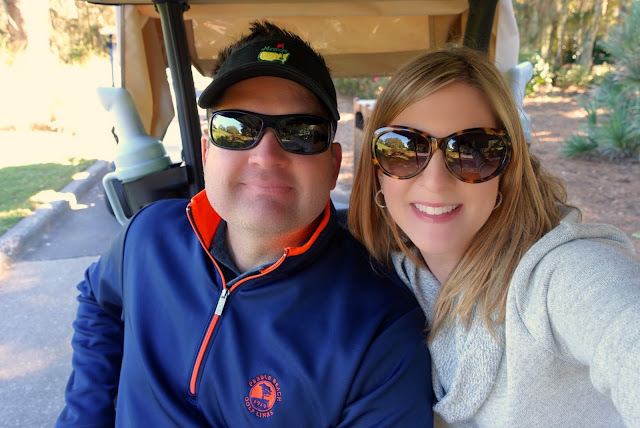 We had THE BEST time in Ponte Vedra. In addition to the golf, we drove over to Jacksonville. We spent the day shopping at St. John's Town Center. I told Chicken Legs that I want to move to Ponte Vedra. I absolutely love it. We continued our Florida trip and went down to St. Augustine. We ate at the best breakfast place ever! You know how to take care of your guy at Christmas. Looks like a great trip and delicious food. Glad to hear you went to St. John's. We go to the PV Inn & Club every June for a conference, and St. John's is a must! Did you do the Golf Hall of Fame? We have been to the Golf Hall of Fame before, but not on this trip. Being from Jacksonville, I was glad to see that your trip did not disappoint. 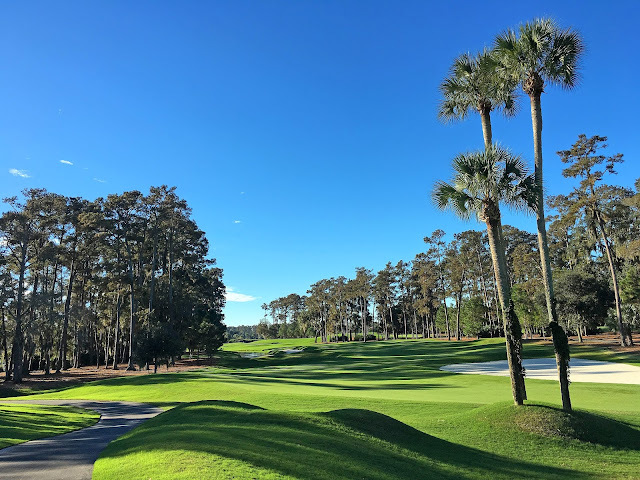 We'd be happy to have you join us here in Northeast Florida! It is SO different from what most people think of when they think of Florida. Glad the weather was good: the blue skies in your pictures should be sent to the Chamber of Commerce. Thanks for the restaurant reviews! 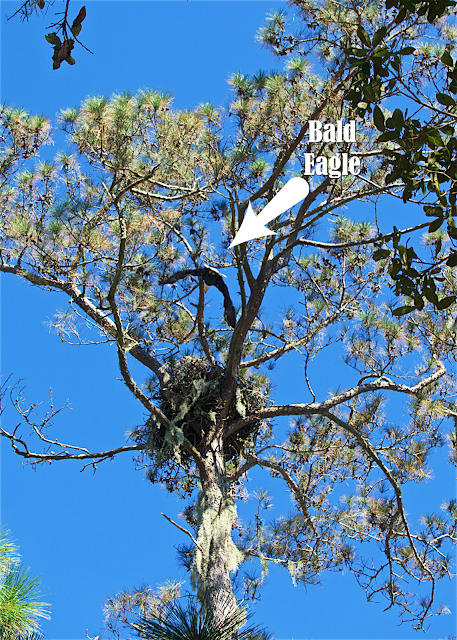 I had to chuckle at you writing about seeing bald eagles for the first time in the wild. I saw 7 of them in two trees on my way to work this morning. I see them all the time. I live in the rural midwest.